How Much Is That Widebody in the Window? Delta CEO Richard Anderson roiled the commercial-aircraft market back in October with a widely reported statement that Boeing was selling used B777-200 jets for as little as $10 million. In the passenger-plane market, that’s considered chump change. If prices were really that low for used equipment, it would create a compelling financial incentive to buy used rather than new planes, undermining demand and driving down prices for new aircraft as well. Boeing stock nosedived on the news. Anderson—who has an obvious vested interest in obtaining the lowest possible prices on aircraft for Delta’s extensive fleet—was at it again last week, with another market-moving pronouncement on cheap used planes. In a tweet from Delta’s News Hub, Anderson revised his earlier statement as follows: “I was wrong when I said used 777s were on market for $10M. It was actually $7.7M. We just signed a letter of intent to buy one.” Boeing’s stock price took another hit. 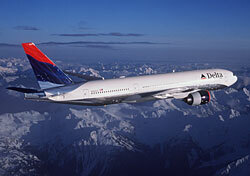 Taking Anderson at his word, we now know that a used B777-200 can be had for as little as $7.7 million. Even without knowing the plane’s age or configuration, that seems a pittance for a newer-generation jumbo jet. But of course, it’s all relative to the cost of new planes. The above are suggested retail prices, and the airlines of course receive substantial discounts based on volume purchases and other considerations. But faced with the choice between buying a new B777 for $277.3 million, even discounted, and a used one for $7.7 million, Delta stockholders would no doubt endorse Anderson’s decision to opt for the latter. Boeing stockholders, not so much.